In a medium saucepan melt the butter, then add in the milk, sugar and salt. Bring the mixture just to a boil and removed from heat. Mix in the flour and stir until it becomes a thick paste. Return the saucepan to medium heat and stir continuously for several minutes as the paste dries out. When the paste is just starting to leave a film residue on the saucepan, remove from heat and put the paste into a bowl of an electric mixture. Mix on low and allow the paste to cool to about 180 degrees or below. Once the paste has cooled, add the eggs one at a time, beating well between each addition. You want the paste to be shiny and come off the beater in thick strands, it will not clear the bowl. You may not need all of the eggs to get to this stage, I think I only used 6. Immediately put the paste into a piping bag and pipe into about 6 inch lengths onto a paper towel, I did two churros per paper towel. Meanwhile, bring a heavy-bottomed pot filled with vegetable oil to 375 degrees. Chill the piped paste before frying, as this helps to keep their shape. I put them on sheet pans in the freezer for about 10 minutes. 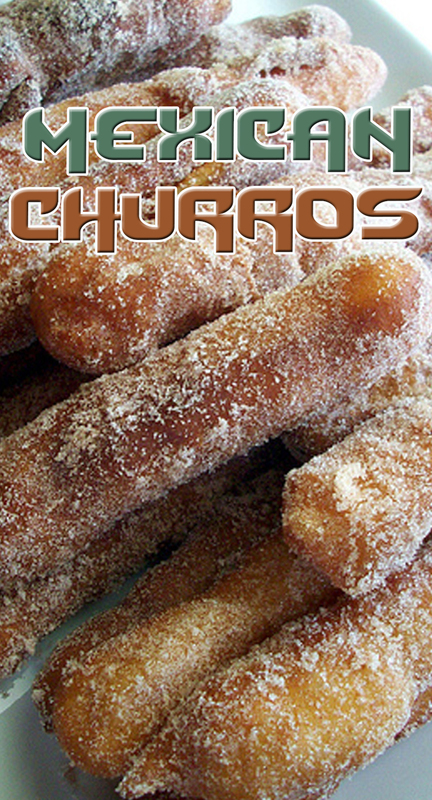 When you are ready to fry your churros, have your cinnamon sugar ready, as well as paper towels to absorb the oil. Now this is the tricky part, when your oil is hot, take the paper towel with the piped paste and carefully place it all face down into the oil. With a pair of tongs, grab an end of the paper towl and peel it away from the churros and oil. It may require a little jostling, but you should be able to remove all of the paper towel, leaving your churros behind. Using the paper towels keeps the churros straight, you may alternately pipe the paste straight into the oil for a more curly product. When the churros are browned evenly, remove from oil and all them to dry momentarily on paper towels to absorb excess oil. Then roll them in cinnamon sugar.